BBC Ghost Stories – Whistle And I’ll Come To You (1968 & 2010). The first of the two BFI releases due out on the 20th of August, this double bill of the classic BBC ghost story adaptations sets the tone for the future releases while also justifying the detail and time put into them. This release contains both adaptations of perhaps M.R. James’ most famous short tale and the release plays wonderfully on the natural juxtaposition of the two very different interpretations. The 1968 version adapted by the talented Jonathan Miller (The Drinking Party, Alice in Wonderland) kick starts this series with chilling perspicacity. Sir Michael Hordern plays an academic professor on holiday on the East Anglian coast. 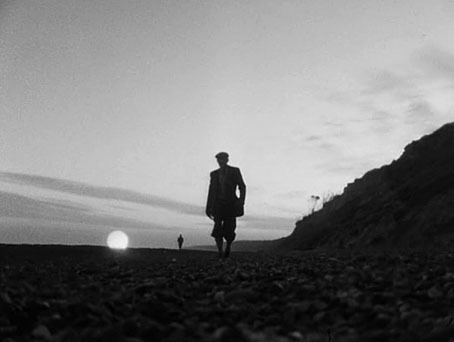 The adaptation focuses on belief systems and how the professor’s pompous logic becomes the undoing of him as he becomes increasingly more haunted after finding an old whistle in a graveyard by the sea. Though the presence of Horden brings to mind images of a certain travelling bear, his performance is astonishingly detailed and nuanced, playing an atypical academic with crumbling people skills and mind alike. This is a piece of work that revels in both its visuals and its soundscape. Miller focuses on the eerie landscape, making it seem beautiful but haunting simultaneously. The idea of a possessed object or an “inorganic demon” as the wonderful accompanying booklet describes it as, is a powerful one, yet here it’s possible to read the haunting as attacks of self-doubt or even dementia as well. The actual visuals of the ghosts are subtlety unnerving but the real scares come from the sounds of film. The dreamscape of Parkin’s as he’s chased along the beach and then sees a cloth-like entity is only truly scary due to the horrible delayed effects of his own voice and waking. The same goes for the final haunting where the sounds of rustling sheets and Parkin’s own hysteria are terrifying and a real jolt as the adaptation ends. Andy de Emmony’s 2010 adaptation is a very different beast. It seems unfairly maligned for being flexible with the source material as well different to the 1968 version, yet it seems that this is only born out of adoration for the originals rather than any real genuine criticism of the adaptation. John Hurt plays our professor sceptic this time, yet he is on no mere holiday. The version opens with Parkin putting his wife into a home as she’s shut down completely with dementia. This is far darker territory than previously explored but it also adds to the emotional impact of the haunting, making it sad as well as scary. The crux of this adaptation is being haunted by someone who is potentially still alive, at least in the physical sense. Parkin is almost angry at the hotel receptionist’s blasé approach to ghosts, where he’s positive that the we are physical and we rot, both inside and out. This implies further that he is in fact being haunted by his wife’s spirit having left her living body though a shock twist of an ending leaves it wonderfully ambiguous. Apart from coming with the aforementioned booklet, the release comes with a small collection of extras as well a brilliant restoration job on the 1968 adaptation. Along with an introduction to the Miller adaptation by Ramsey Cambell, he reads his own James inspired Ghost story: The Guide. There’s also an eerie reading of the original James short by Neil Brand and a short discussion with Jonathan Miller and Christopher Frayling about the program. Ghosts are scarier in fiction when they strike fear into the hearts of non-believers. Both versions of Whistle and I’ll Come To You play on this admirably and are the defining release of this range. A frighteningly brilliant start that is rich in British Gothic sensibilities, innovation and taste. Great write up, Adam! I have yet to watch Hurt’s version but I am looking forward to it. I agree with your observation about the visuals and soundscape of Miller’s entry. Spot on, man. This was a great read. Keep up the good work. Agreed. It’s what drew me right in. These effective films are so few in number.